A few years ago, I was trapped and duped. It pained me so much because I never anticipated it. In retrospect, I realized that I had the opportunity to handle the issue in a sensitive way such that it would not have caused me hurt feelings. I wish I had dealt with the issue in a more sensitive way. You can agree with me that it hurts to be duped. I was so hurt that I cried for days (I don’t get water-eyed so easily). We have all been victims of some tricks and snares. It is one thing to face traps, intrigues, manipulations and machinations. How we deal with them is quite another thing. The kind of trapping and duping I am attempting to throw light on is one that a man or woman orchestrates and inflicts on himself or herself. Charles Spurgeon has observed that, “Beware of no man more than yourself; we carry our worst enemies within us.” More often than not, we have been entrapped in self-inflicted pain usually due to indiscretion, or failure to exercise self-control. When tempted, no one should say, ‘God is tempting me.’ For God cannot be tempted by evil, nor does He tempt anyone; but each one is tempted when, by his own evil desire, he is dragged away and enticed (James 1:13,14 NIV). Putting the reference in to context (verses 12-18), we realize that even though James writes about a temptation that comes from within us, he assures the reader in verse 12 about the benefit of endurance. In verses 13-18, he gives an eye-opener on the basis of enticement. Let us see an example of how temptation can occur in our finances. For instance, we Americans buy so much so that we spend about twelve billion dollars on storage facilities a year. It has been observed that the self-storage business supersedes the music industry. When we bow to the inner pressure to buy more and more stuff, it is a proof that materialism, consumption, acquisition, and hoarding appeal to us. When we deliberately fail to bow down to the pressure of impulsive buying, it implies that materialism no more appeals to us. The More the pressure on us to selfishly lavish our financial resources on ourselves, the more we should think that we need to generously direct part our resources towards the cause of caring for the welfare and satisfaction of the needy. God gives us everything that we have in this world. He expects us to manifest faithful stewardship in the way we use those resources. We are not inward-looking hoarders, but outward-looking distributors, treating people with warmth and immense generosity. God’s ardent wish is to have His way in our lives. He wants to influence us in “so simple a thing as how we use a dime.” Let us allow Him to have His way in our lives, because His will is always beneficial. We may not necessarily be financial experts to come to terms with the fact that, one of the greatest ways to financial prosperity is withholding present purchases. Hence, we are able to save and invest. Thus, we become beneficiaries of the abundance that God, our Father has stored for us. He is faithful, but we have to do our own part. God wants us to align our spending patterns with His infallible word. Failing to heed God’s counsel is like wandering away from His protection, and as we wander away the devil uses his wiles to enable us to make our own gallows in which we become trapped. When materialism (very strong want to own things) becomes one’s weakness; it becomes one’s insecurity – a thumbscrew that one unconsciously uses to turn to one’s disadvantage. Since humankind by nature is insatiable, the wish to always buy stuff and the grace to resist usually looks like a David and Goliath confrontation wherein we prevail when we resist that temptation by God’s grace. Surely, there is something you and I need to put right with respect to our spending. Even though this article explores the area of our finances, the proven principles of God’s Word are applicable to every area that our self-control is tested. Let us imagine how the world would become a better place when we all inculcate the principle of being compassionate by saving some of our hard-earned financial resources and use it to help the needy! Since we have a better understanding about the negative consequences of materialism, by God’s help we can prepare a defense against consumerism so that we will not be trapped and duped. I will briefly describe the leadership actions of Charles Haddon Spurgeon with reference to his relationship with God, roles, responsibilities and results. There is an old saying, ‘The heart makes the theologian,’ and Charles Haddon Spurgeon’s theology certainly came from his heart. He was convinced of God’s love for him, and of God’s desire to save all who would come to him. This was Spurgeon’s message throughout his life. 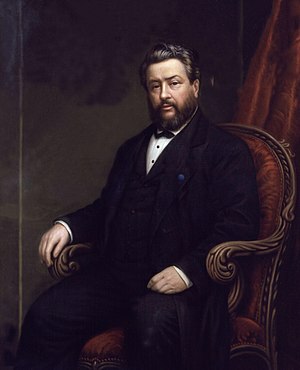 In this reflection on Charles Spurgeon’s leadership actions, I see him as God’s servant who effectively led and systematically managed a mega-church. Above all, he was a preacher who communicated the Gospel message by vocalization and printed matter, thereby reaching thousands who met God!